You can rely on West Twelve to help you diagnose any damp issues you have. Our independent damp and timber surveys will help highlight damp and timber issues in your property throughout London, Bristol, Exeter and Surrey. The presence of damp is often ignored by homeowners, or simply not recognised until a building is surveyed when, for example, the property is being sold or remortgaged. Damp in buildings is frequently misdiagnosed by many damp proofing contractors, often leading to hundreds, in some cases thousands of pounds on unnecessary and inappropriate treatments that can cause further damage to the structure, particularly with old and period properties. You can trust us to provide you an accurate and unbiased survey because we are independent which means we can have no ulterior motives in our surveys, we do not fix issues we find with your property, we only recommend the course of action you should take. Dampness tends to feature heavily in valuation and mortgage surveys leading to a recommendation that a “specialist contractor” is instructed to carry out an inspection. This is when the less scrupulous contractors seize the opportunity for a salesman, disguised as a “surveyor” to enter your property and sell to you “solutions” to a problem that probably doesn’t actually exist. All that said, dampness in its various forms is a great concern to the majority of property owners. 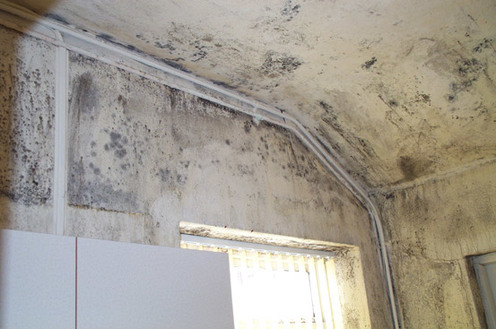 Damp in buildings creates unhealthy living conditions, mould growths, soiling of decorations and damage to wall plasters and coatings. Prolonged exposure to damp can lead to plaster failure, mineral salt contamination and also masonry erosion. 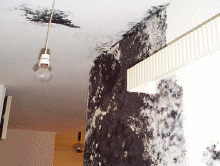 All forms of fungal decay, including wet and dry rot are associated with moisture and dampness. If remedial treatments are required it is of prime importance that the source of dampness is correctly diagnosed and that remedial treatments, if required, address the source and not just the symptom. It does exist, but is not as common as frequently found by damp proofing contractors. Rising damp in its true form is caused by the capillary rise of moisture through porous masonry as rising damp tends to exist in older properties that were constructed without a damp proof course. Where a damp proof course does exist dampness may be occurring as a result of a breakdown in the damp proof course or that it has become bridged by external ground levels, paths, patios etc. When rising damp does occur in masonry it carries with it soluble ground salts, more commonly nitrates and chlorides, which are deposited upon masonry and plaster work as the damp evaporates. Long term rising damp leads to a concentration of salts displayed at the highest levels that the rising damp has raised to. A key factor in diagnosing true rising damp is that this form of dampness does not display itself as free surface moisture or physical water upon the surface of the wall. 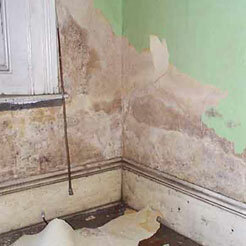 Rising damp is the result of capillary held moisture. Misunderstanding this basic principle is one of the reasons why home-buyer surveyors misdiagnose rising damp, paving the way for the damp proofing salesman. West Twelve Independent Specialist Surveyors cover London, Bristol and Exeter. Request a Damp Survey. The term penetrating damp can be used to cover many aspects of dampness that is not directly related to what we now know as rising damp. For ease of reference we can use two categories to explain penetrating damp. Lateral penetration dampness occurs on walls that are below ground, or where the outside ground levels are higher than the internal floor levels. This is sometimes referred to as earth retaining walls. Basements and cellars are a typical example where earth retaining walls exist as a result are particularly prone to the effects of lateral penetrating dampness. Other sources of lateral penetrating dampness are raised flower beds, gardens, patios, paths and drives. Poorly constructed boundary walls can also be a source of lateral penetrating dampness. Vertical penetrating dampness is associated with building defects, neglect and poorly maintained properties. Common faults in this category include leaking roofs, flashing, rendering, pointing, guttering, rainwater pipes, poor external decorations, rotting joinery, including window and doors can be a source of vertical penetrating dampness. We would also include defective or leaking internal plumbing in the category of vertical penetrating dampness. 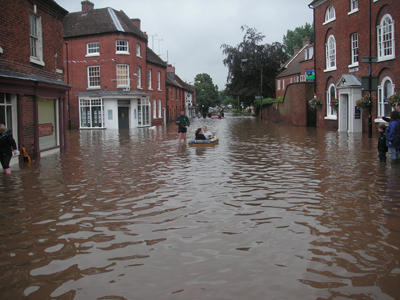 We are a damp specialist, working throughout the South of England including London, Bristol, Reading, Surrey and Exeter.